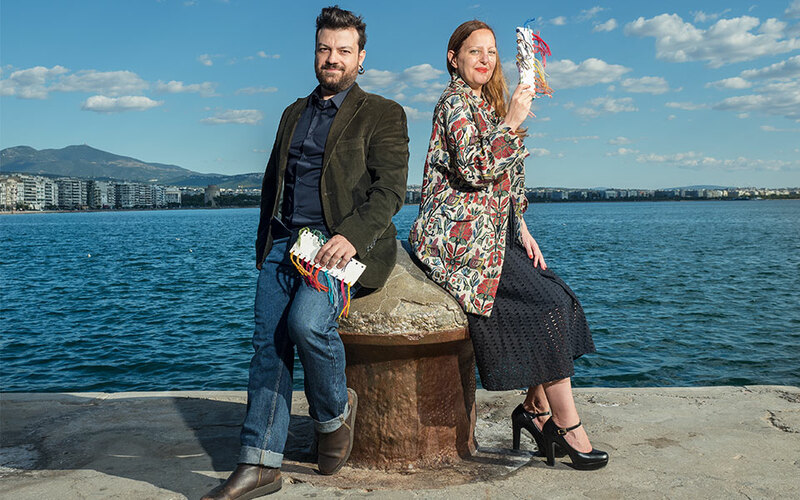 Twelve innovative young Thessaloniki residents meet with us at their favorite waterfront spots to explain how the city helps to inspire them in their work. 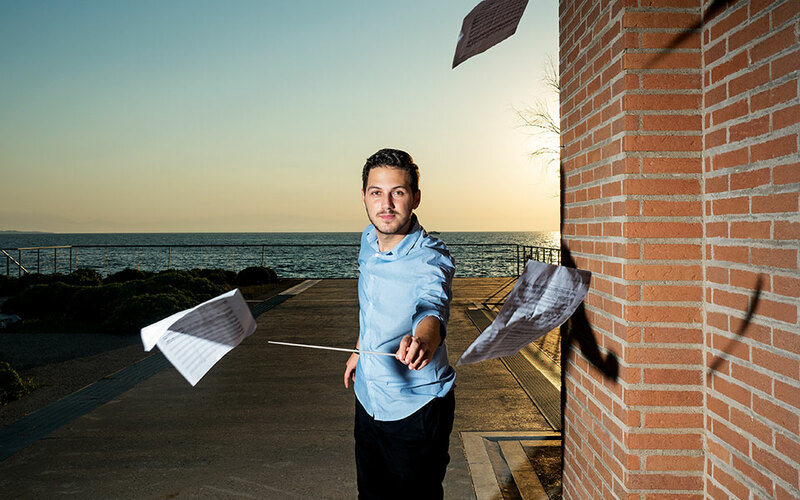 Born and raised in Ptolemaida, 20-year-old Alexandros is studying Music Science and Arts at the University of Macedonia in Thessaloniki and is one of the youngest conductors in Greece. When the afternoon rehearsals of the Symphony Orchestra of the University of Macedonia are over, I often stroll around the city listening to classical music on the radio, humming along to operas. Sometimes I take my headphones off and listen to the natural sounds that surround me instead, the city’s own soundtrack. There’s a hidden harmony amid the chaos of Thessaloniki, a composition that accompanies you as you move around the city. This music includes the noise of the crowds and the cars on Egnatia Avenue, the melodies of street musicians, the cries of toddlers and babies, and the footfalls of joggers along the seaside promenade. The fishermen’s songs and the splash of the waves at the end of the New Waterfront are in there, too, as are the shouts from merchants at the Kapani Market, and the lively discussions among the students at their hangouts on Navarinou Street. Then there’s near silence, the hush at the Rotunda. I don’t think I’m the only one that hears this concert. 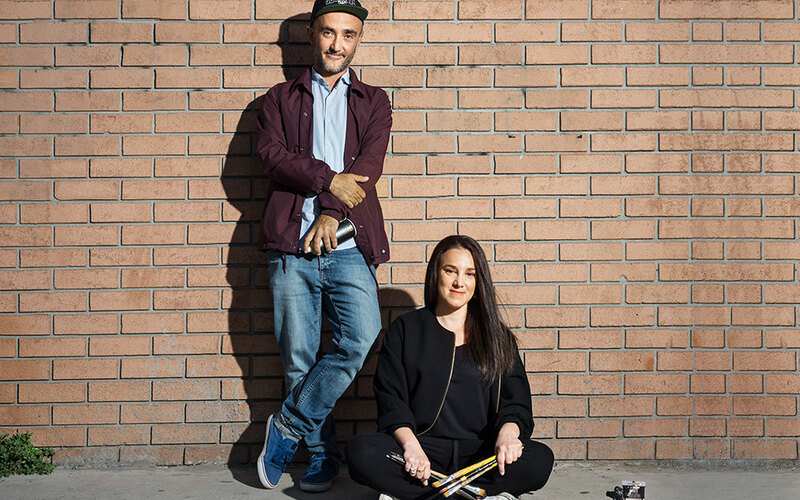 In recent years, more and more young people have found a creative outlet in symphonic music and expressed interest in joining one of Thessaloniki’s musical ensembles. New orchestras, the nurseries of future musicians, have been formed, including Muse, the Youth Symphony Orchestra of the Thessaloniki Concert Hall. I’m thinking of continuing my studies abroad, but it would wonderful if, in the future, there were big musical productions and creative collaborations here at home, projects that could tempt back those who move away in order to expand their horizons, but are still filled with nostalgia for their city. 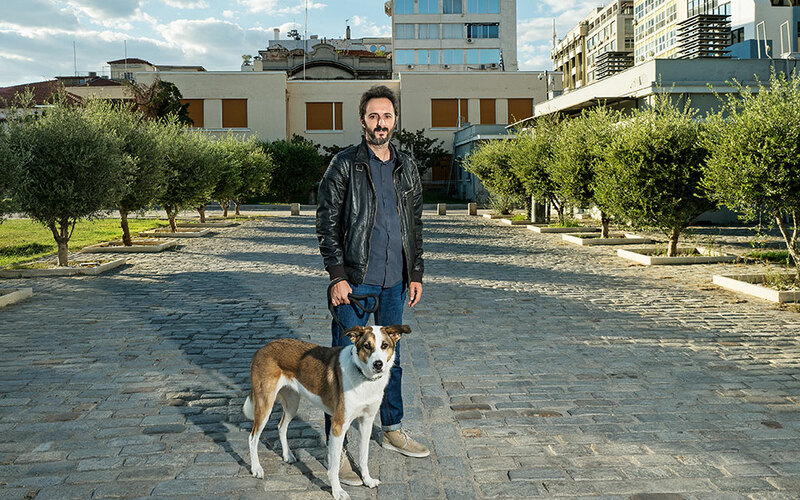 Pantelis comes from Velo, a village near Corinth and moved to Thessaloniki in 2004 to study automotive engineering at the Alexandreio Technical Institute. After spending almost half my life here, I’m starting to think of Thessaloniki as my city. Three years ago, Anna and I started Elektronio, where we build electric bicycles, something we are passionate about. 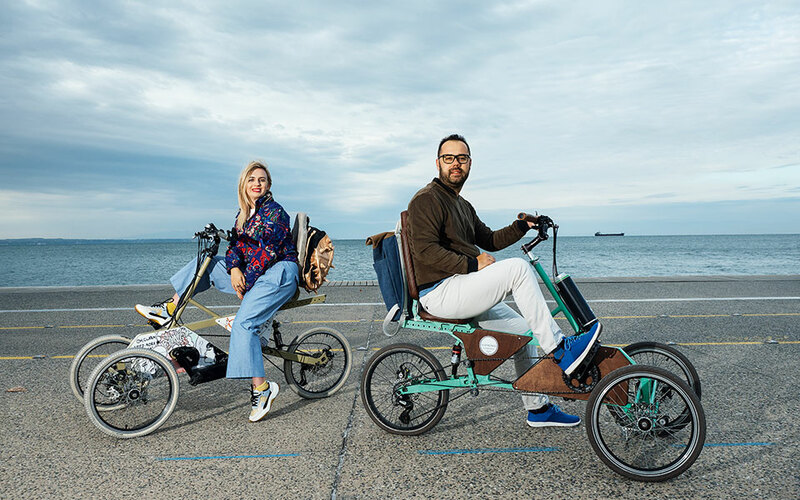 We want to encourage people to use our bicycles not just for leisure, but also for getting around on a daily basis; they’re perfect in small cities with lots of traffic, like Thessaloniki. Our home on the eastern side of the city is about 5km from our lab in Ano Ladadika, and I cycle to work every morning along the coastal bicycle track. It’s always quiet and cool at that time of day. I never left Thessaloniki, because I believed in something, and I saw it start to blossom, something that’s still growing today. More and more locals are using our handcrafted bicycles, and we’re beginning to export them all over Greece and the rest of Europe. Our vision going forward is to keep finding new ways to contribute to smart urban mobility. We spend nights at the lab working late, envisioning new bicycle designs that will make life easier for a lot of people. There’s one coming out soon, a special edition model aimed at people who, because of certain health problems, can’t ride a conventional bicycle. Tenia grew up in Thessaloniki and studied interior design in the city, and retail design at the Elisava Barcelona School of Design and Engineering. In the end, I began building my future in Thessaloniki, converting an old leather goods factory into a multifunctional space. I named it ApoDec; now, six years down the road, it serves as a meeting point for creative people, a spot where they can express themselves freely, where we can all turn our craziest ideas into reality. This “small-scale” aspect of Thessaloniki, along with the fact that it’s safe and awake 24/7, makes it a dream city for students. I believe that it has the dynamic needed to evolve into an international university town, attracting those who cannot afford the high tuition fees and steep rents found in other university towns throughout Europe. This year, I began teaching at a private college in Thessaloniki; in my class, most of the students aren’t Greek – they hail from places like the Balkans or India; there’s one student from Iran, and another from Kenya. I’d like it if the city could rediscover the multicultural character it once possessed, the one that the scattered remnants of so many different cultures gifted it. We are represented by Kalfayan Galleries, Thessaloniki-Athens, a group with an international reach and one which participates in important contemporary art fairs, so it has been possible for our work to reach a widespread audience, without our Thessaloniki base being an obstacle. In fact, the city serves us perfectly as a quiet retreat. We spend most of our time in our studio, K&K Showroom, which is located in a listed 1930s building that also serves as a cultural venue in the historic center. When we’re not there, we’re most likely at the waterfront, riding our bicycles, taking a walk or just relaxing on a bench, talking or reading. Klio Tantalidis was born in Thessaloniki but left town after high school to study painting, print making and digital arts in the Netherlands and in the US. I like to think that Chicago, where I spent several years training and working in the area of digital arts, helped shape my way of thinking, and that Thessaloniki, to which I returned in 2007, shaped the way I sense the world. Located at the crossroads of great civilizations, it has always encompassed distinct cultural elements from both the East and West. Its history and multicultural identity, in combination with the experiences that we gained traveling and living abroad, prompt unexpected cultural references that shape the art that we do together. Thessaloniki is on the periphery of current artistic developments and, even though it has a creative momentum that yields pioneering art, it has never been able to maintain this output. Nevertheless, its institutions, festivals and creative collectives are all helping the public become more familiar with contemporary cultural output. Born and raised in Thessaloniki, Chris has worked as a DJ, radio producer and bar manager. 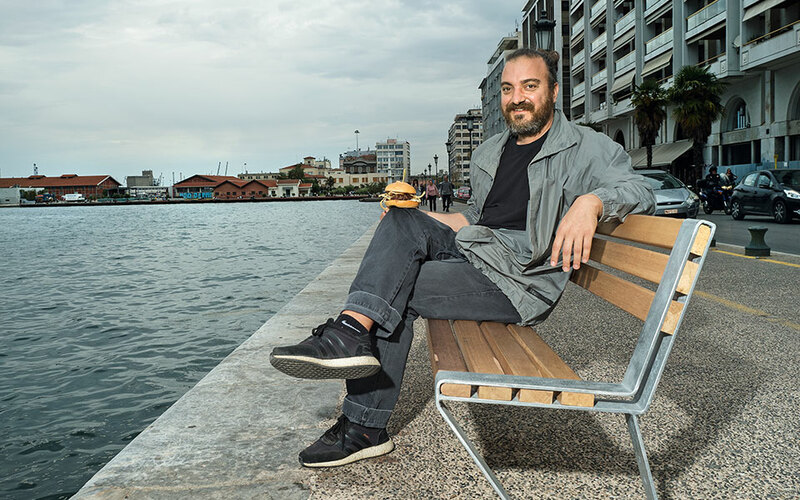 In 2015, he founded SoulFood Thessaloniki, an initiative that organizes various gastronomic events, including the first street food festival in the city. Thessaloniki’s cuisine has always drawn on influences from around the world; the people who immigrated here in the past always brought their own taste preferences and recipes with them. Foodwise, I’d characterize Thessaloniki as a charming “mongrel” of a city. It has all of the makings of a gastronomic capital: good-quality ingredients, inspired chefs, modern delis and restaurants, and a “let’s-go-out” culture. It also has a maritime feel and a lot of sunshine. It was that energy that the sun emits, even in winter months, that I missed most during my five-year stint in Berlin. When I left to go there in 2011, it was because I’d felt really bogged down and, searching for inspiration, I ended up turning what had been my hobby into my vocation. Together with two Berlin-based friends, I started cooking and organizing pop-up gastronomic events dedicated to Greek cuisine in little bars in Kreuzberg and in Neukölln, as well as in the famous Markthalles, or food markets. A strong response from residents of various ethnic backgrounds made me wonder: “Why here and not in Thessaloniki?” And so I returned, in order to put everything I’d learned into practice. Kostis Karatzias, Demis Samaras and I founded SoulFood Thessaloniki. Today, street food, beer, coffee and brunch festivals have become established events, held every year; they’re growing in popularity too, attracting thousands of locals, and others from throughout the Balkans. Dimitris grew up in Athens and in Serres, and came to Thessaloniki to study architecture but was quickly won over by graphic design and visual communication. His work has won major international distinctions (Red Dot Design, D&AD and Dieline awards). I’m not someone who likes to sing the praises of Thessaloniki, my place of residence for the past 22 years. I often feel that I live in an inflexible city whose people care only for appearances. And yet, I wouldn’t change a thing about the place. It’s precisely this aspect of the city’s character that makes it interesting. My work isn’t limited by the city’s boundaries. I move between Thessaloniki, Athens and the US. I have several stable foreign collaborators covering a broad geographic spectrum, and, depending on the project, I either design alone or put together teams based on the individual features and requirements of each project. One of the most satisfying recent ventures was our successful submission, in February 2016, to the competition for the visual identity of the National Library of Greece, with whom we have been working ever since. I also consider the invitation I received in May 2016 from Nike to join their Global Football department at the company’s global headquarters in Portland, Oregon, as a milestone in my career. I continue to maintain a strong professional relationship with them, with the aim of relocating there in the near future. Perhaps the most important reason why I love Thessaloniki is the fact that it’s here that I met Baloo, the stray dog that picked me out as its friend. We both love taking a stroll to Krini and Aretsou in the eastern part of the city. A special favorite spot of ours is Elxate, a small café-bar close to Navarinou Square, and I also love places that have left their mark on history, such as the Macedonian Museum of Contemporary Art. Argiris Saraslanidis is a Thessaloniki native who studied graphic design, illustration and comics and is considered one of the pioneers of the Greek street art scene. I’ve been drawing since I was a child. For me, the best canvas is the nearby wall of an ugly, modern Greek apartment block. I draw inspiration from pop culture, including hip hop and comics, and pictures from my own imaginary universe have been featured on walls, as well as in art galleries in several European cities. In the early 1990s, when I started to spray-paint, street art was not as widespread as it is today. It was very difficult to get permits and I’m keen to draw legally. I often am able to work thanks to the funding I receive from local residents or from school parents’ associations. You can see my biggest work on the wall of the eight-story youth hostel Stay. My ambition is to see the creatures I create add color and joy to people’s lives, getting them to change their daily journeys just so that they can look at my work and smile. Simoni grew up in Corfu, studied art conservation in Athens, lives in Thessaloniki and works around the world. Painting has been a major part of my life since childhood. My background is in art conservation. Although I only practiced it professionally for a brief period, I think my education has helped me achieve a more in-depth understanding and appreciation of artworks. Strangely enough, the art form that won my heart has no real duration. It’s possible that a work that might take me up to two weeks to complete will only last a day. My style – a hybrid of Japanese iconography, manga, pop surrealism and various other references filtered through my own personal aesthetic and fantasy world – is commonly recognized as street art. My interest in street art developed through my relationship with Argiris Ser, my companion and artistic alter-ego. My aim is to create characters that abound with female energy and tenderness. 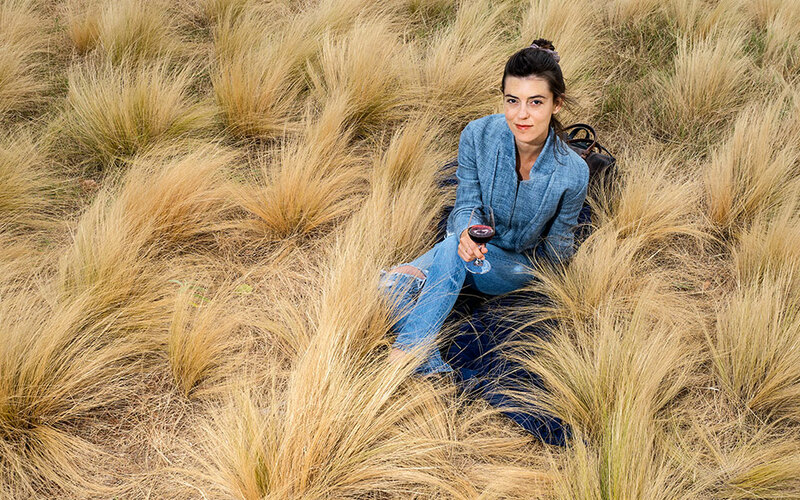 Maria studied oenology in France at the University of Bordeaux’s Institute of Vine and Wine Science and worked in winemaking before returning to her hometown of Thessaloniki in 2013. For me, wine is a part of Greek culture and Greek history, a source of inspiration. The more you know about wine, the more you enjoy it. The same is true of Thessaloniki; it doesn’t reveal all of its charms all at once. You discover them in doses, as you explore the city’s history and delve into its multicultural character. I lived in France for five years, but, inspired by my belief that my city held enormous potential for me, I decided to come back. In 2015, I opened my own specialized wine shop, Bientôt, the first of its kind in Thessaloniki. At that time, there was a shortage of wine-related choices on offer. Things only started changing with the growth of tourism and the evolution of the food scene. Right now, more than half of Bientôt’s customers are tourists, mainly from France, Belgium, Denmark and the US. Most people love to travel, and there’s an increasing number of them who are interested in learning about their destination from its local wine. I want visitors to my city to acquire memories and points of reference so that when they go back home, they will remember the stories we shared in Bientôt, so that they will revisit Thessaloniki in the future to experience new life stories. Sotiris was born and raised in Thessaloniki and is a postdoctoral researcher and instructor at the School of Film of Aristotle University. He works as a screenwriter, film producer and director. His latest short film “9023” has been screened at 35 festivals in 18 countries, including a showing at Comic-Con International. Thessaloniki is a cinematic city, with many stimuli. It offers an astounding range of locations, people and style elements, allowing the place, by its very nature, to act as one big film studio with natural lighting. Moreover, in recent years, thanks to the School of Film, the city has made a dynamic entrance into the world of filmmaking, with the potential of becoming a film production hub offering almost non-stop sunshine along with its other charms. There’s no genre limitation here: the Fix area will inspire you to shoot a horror film; the New Waterfront cries out for a musical; the old buildings on Valaoritou Street are ideal for a film noir. Thessaloniki has, of course, been the set of my own films as well, including my latest work, “9023,” a short-length feature. The film is set in a dystopian present in which, because of a great nationwide famine, the government has permitted the consumption of non-productive citizens as food. I am a big fan of horror flicks, so I would give anything for the next film of a famous franchise – such as “Halloween” – to be shot in Thessaloniki, by none other than John Carpenter himself! If I were to ever do a remake of a film in Thessaloniki, it would have to be “A Nightmare on Elm Street,” which would be set in a neighborhood in the western districts of the city, the area where I grew up.